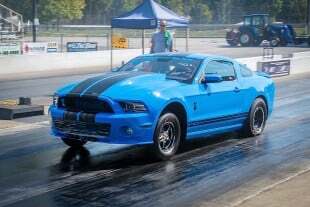 Properly calibrating a drag car’s chassis to work at the dragstrip is the result of a partnership between the front and rear suspension systems, adjusted properly to optimize the launch process and maximize forward progress while eliminating unwanted motion. The rear suspension might plant all the power, but it needs a well-designed and adjusted front suspension to assist with the critical weight transfer process. Our Project BlownZ06 radial tire C7 Corvette will be putting a ton of power to the ground, and so Tony Mandella and the team at PMR Race Cars laid out the front half of the car to ensure it could use every bit of the power on tap. In our previous article focusing on the chassis of BlownZ06, we looked at how the rear suspension was designed and how it played into the overall car design. The big takeaway was the following: that building a radial tire car which still uses the stock wheelbase dimensions is a challenge, and that carries through to the front of the car, as well. PMR had their hands full trying to fit everything under the nose of the Corvette, but they worked their magic, and as you can see here, the final product is a thing of beauty. A high-caliber build such as this requires parts that are of high quality. For the front suspension, we used a variety of parts from the Quarter-Max catalog to make sure the car would have the highest levels of adjustability. Working within the Quarter-Max suspension parts will be a set of JRi shocks and Hyperco springs to take care of the car’s dampening needs. Going fast is fun, but stopping is important too, so a killer set of Strange Engineering carbon fiber brakes were implemented on the front of BlownZ06. Before any tubing was cut and laid out, PMR had to begin the build of BlownZ06 with the OEM framerails. The framerails were purchased as separate pieces and represent the cornerstones of the foundation on BlownZ06. Because the rules are clear and strict on the framerails and wheelbase, these went on the chassis jig first to make sure the car would be legal for the classes it will be raced in. These OEM framerails are where everything started for BlownZ06. They ensure the car is well within the rules for the classes it will be racing in. After the framerails were laid out, all the work could begin on BlownZ06, including the front end design. Mandella had to be very practical in how he started the car since the Corvette has such a unique design and required some extra steps to begin the build. After the mockup procedures for these components were complete,, Mandella was able to begin the process of getting the front end placed in the correct location and check the dimensions. That allowed him to figure out where the front tire placement would need to be, then where the strut would go, followed by the upper strut and A-arm. After the framerails established the foundation for the Corvette, PMR was able to begin the process of fabricating the rest of the car. One of the biggest challenges with designing the front suspension and placing items in the front of a Corvette like BlownZ06 is the available space. The body itself creates limits on where you can put different items, and the wheelbase rules also dictate where the suspension can go. This saddled PMR with a new set of challenges in building BlownZ06’s chassis. “On this car, because everything is mounted right in the front, from the ProCharger to the fuel cell, there’s a lot of stuff that you account for. Everything needs to be mocked up correctly and really thought-out to ensure you don’t step on your own foot during the build. We ran into that challenge with this build because we didn’t have the ProCharger mounts until later in the project. We couldn’t finish the front rack and pinion until after we wanted to, so we had to wait to finalize a lot of items until we had all the right components,” Mandella explains. 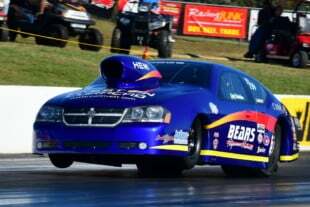 Having a front and rear suspension that work together is critical to getting a high-powered radial tire car down the track. 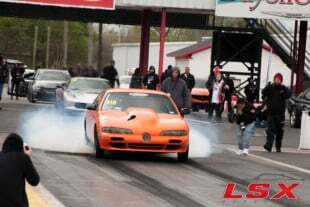 A strut that can control the front end is a big part of what separates a good run from one that ends in tire smoke. The strut must be able to hold the front end down on a surface with ample traction, but be able to extend and transfer weight to the rear tires when there is less grip. With a radial tire car, front end suspension travel is the key to making a great pass. 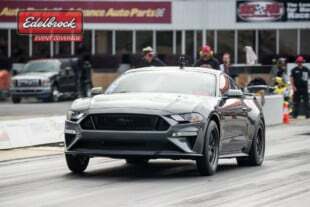 The car must be able to transfer enough weight to the rear to get the tire to stick, while at the same time keeping the front end down as the radial tire is being driven into the track by the rear suspension. Having the right amount of rebound and travel in the front suspension is what makes this happen, so the design must allow for it. Part of the suspension design is where the front struts need to be placed. There are several different factors that are added to the strut placement equation. These factors are paramount not only to a suspension that works well, but also to allow for proper placement also allows for optimal adjustments when track conditions are not ideal. A key part of the suspension on a car like BlownZ06 is the strut placement. Having the struts laid out correctly helps the car transfer weight correctly and allows for adjustments based on track conditions that will work. “The strut placement itself is dictated by the body, the wheelbase, and you also want to check the turning radius of the car. Everything else we do on the front is built around the strut placement, so you have to get the geometry right. You also have to pay attention to the steering geometry in strut placement, in case the driver really has to wheel the car in an emergency. This will make sure the car is turning enough and responds to input from the driver. The strut placement is important because it makes sure the car stays within the rules for the wheelbase size of the class, and making sure it fits correctly within the body,” Mandella explains. 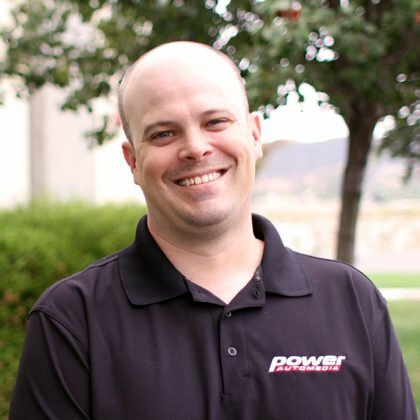 Finding the Pro Line engine a home between the framerails of BlownZ06 wasn’t a task that Mandella took lightly. 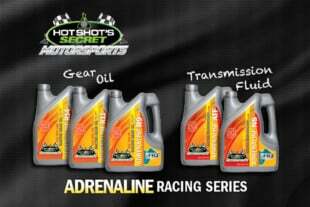 Having the engine in the correct location is what dictates how well the car is able to transfer weight to the rear and how the suspension will work overall. Since space was at a premium in the BlownZ06 chassis, PMR had to be sure they got the engine placement right the first time. “The big thing we look at is where the back of the block is in relation to the axle centerline. The other thing is the crankshaft centerline in relation to the ground — this is what sets the engine’s height inside the chassis. The engine is the majority of weight in the car, so if you put it too far forward or too far back it will cause problems with suspension. If you move it one inch forward or back you’re going to shift a fair amount of weight around from a scaling point for the car and that makes setting up everything else difficult,” Mandella shares. Since things are so tight in the front of the Corvette, PMR had to use the mid plate as part of the firewall. The firewall also played a role in the engine placement and required some considerable fabrication to make it work with the location that was established. “There’s nothing stock with this firewall at all. It’s all just welded steel panels into each section of the firewall using triangles. Everything is based around where the transmission and engine meet up. The mid-plate is actually being used as part of the firewall and we built off of it from there,” Mandella explains. The confining dimensions of the stock nose placed a large hurdle in front of the PMR crew with respect to getting the engine located in the right position. There was a lot of massage work that needed to be done to get the engine to fit, but it worked out and allowed the Hemi to find a home that wouldn’t change the weight distribution of the car too much. Since much of the Corvette is designed like a Pro Mod, with the level of power it’s making and safety requirements, space becomes difficult to come by. 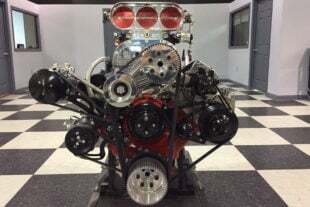 Yet none of the body parts can be stretched like a Pro Mod, so the task of getting things to fit becomes more difficult. “The Corvette nose dives down really quickly, so you run out of space in a hurry. We had to squeeze the eight-gallon fuel cell, F-3 ProCharger, headlights, and all the framework to support the front suspension under the nose of the car. We really had to think about the placement of everything and how it would affect other parts as we went along,” Mandella says. After a lot of trial fitting and modifications, PMR was able to get the nose to fit on BlownZ06. The car still retains the factory body lines and falls within the rules of small tire racing. With the engine in place, it was time to get the fenders and hood on the Corvette. 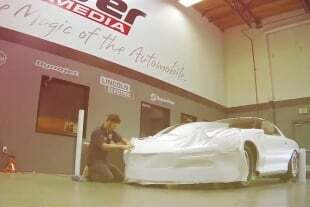 Since moving it wasn’t an option, when there were some clearance issues PMR had to get creative in getting the hood to fit while still looking as close to factory as possible. “The modifications we had to make to the hood were extensive, to say the least. After the engine was placed, we notice that the hood was hitting where the throttle body was located. We needed another three inches of clearance just to fit the hood over the engine, let alone all the tubing for the blower. We put a lot of work into the hood to make it look like it was nearly stock and fit correctly over the engine,” Mandella explains. All of the design work and fabrication on the front half of BlownZ06 has been enhanced by some quality parts to help on-track performance. With a car like this, nearly everything is custom and needs to be modified to fit. PMR had to carefully select what suspension they used to make sure it would move the Corvette towards its goals of radial tire dominance, while still falling within the rules. The base of the front suspension is the Quarter-Max A-arm kit, a solution that provides parts that can be modified to fit any project. This solid foundation for the front suspension allowed PMR to get a good start to helping create a system that will be adjustable and transfer weight correctly. The Quarter-Max A-arm kit really sped up the process of getting the front suspension lined out. “What Quarter-Max provides is a simple and effective kit that’s filled with the right parts to work with and it makes the install go quicker. Their kit makes it nice because you don’t have to custom-fabricate any brackets, and it provides enough material for us to make it our own as far as where it needed to fit, geometry-wise,” Mandella explains. The A-arm kit was paired with the Quarter-Max Threaded Adjustable Strut Mount kit on BlownZ06. 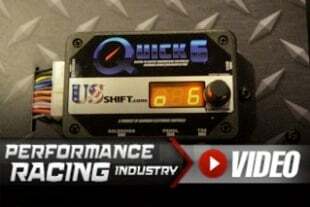 We covered this nifty kit in-depth right here and explained how it can help a racecar become a breeze to adjust at the track. “The upper strut mount kit is nice because it’s fully threaded and adjustable, so it gives you another way to change the ride height, which is cool. 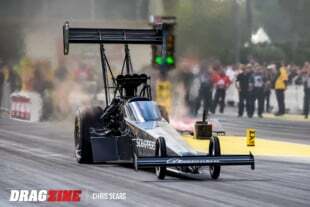 Being able to change the ride height by moving the mounts without messing with the spring or front end travel is a huge advantage, especially on a radial tire car,” Mandella says. The adjustable Quarter-Max strut mounts will give BlownZ06 even more adjustment options, so when the track gets tricky, it will still be able to make clean passes. Inside the Quarter-Max strut mounts are a trick set of JRi struts that are specifically made for a radial application like the BlownZ06 Corvette. These struts offer a massive 6-inches of stroke that allow for the extra travel needed on a radial tire car. The struts are adjustable with several settings for high and low rebound settings. To learn more about these amazing struts check out our previous article here that gives all the details on their inner and outer workings. These JRi struts are designed for the extra front end travel that's needed on a radial tire car. To help the JRi struts do their job of planting the power, a set of coil-over springs from Hyperco were paired with them. Hyperco’s Hypercoil line of coil-over springs use a spring design know as Optimum body Diameter (OBD) for drag racing applications. The OPD design adjusts the body diameter of the spring in relation to the end coils — this allows for the ultra-high tensile spring materials that Hyperco uses to be maximized to their full potential. A 225-pound spring was used for the front of BlownZ06 so the car will get the best suspension travel possible. Bringing the Corvette to a stop will be a set of spindle mounted carbon fiber brakes from Strange Engineering. 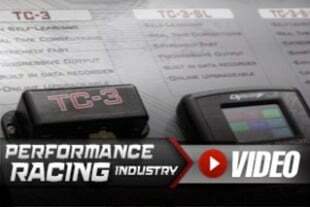 The kit features billet single-piston 1 3/4-inch calipers to help bring the Corvette to a stop in a hurry. The brake kit also features large 10-inch carbon rotors and large carbon fiber brake pads to enhance the stopping power. What makes these brakes so desirable for a car like BlownZ06 is their lightweight properties. At just 12 pounds, this braking system will remove an immense amount of un-sprung weight from the front of the car. The carbon brakes are also resistant to thermal shock — an issue that can cause brake rotors made from steel or cast iron to warp or crack. Strange Engineering brakes at all four corners will help make bringing BlownZ06 to a stop simple. PMR spent some time planning how they would route all the plumbing to the brakes to make the Corvette even safer. “With the brake lines, we have to route them correctly and keep them protected since the car is so low. We don’t run them in traditional spots, so they are inside the car out of the way,” Mandella explains. To help BlownZ06 stay light on its feet special attention was paid to the front wheels used. WELD’s Full Throttle wheels were selected because of their strong and lightweight 6061-T6 forged aluminum construction. Wrapped around the WELD wheels is a set of Mickey Thompson 26 x 4.5 tires to help with the steering duties. We did a full write-up on the amazing benefits offered by these wheels right here. The WELD Full Throttle wheels will save some weight up front and give BlownZ06 an aggessive look! Even with the tight confines of a current-generation Z06 Corvette front end, PMR Race Cars was able to design a well-thought-out front suspension that will help BlownZ06 perform at its best on a set of drag radials. The front suspension of the car should be able to work in unison with the rear suspension to put down all the ProCharged power the Pro Line Racing Hemi will produce. In our next installment on BlownZ06 we’ll take a look at the interior of the Corvette and other body parts.